Windows 10 podcasts are a good way to listen to information and entertainment. It’s easy to find, install and listen to podcasts that interest you, anytime. Podcasts have been around for a long time, and there are lots of them. Basically, a podcast is an audio file you can play on your computer, smart phone, or media device like an iPod. Podcasts exist for all kinds of news, opinion, entertainment and special interest topics. Most people subscribe to podcasts using a specialized podcast app or a podcast distribution service, like Apple iTunes. Since I prefer not to get tied into vendor ecosystems (especially Apple) I thought I would experiment with podcasts in Windows 10. While you can listen to podcasts using a web browser, I chose a dedicated Windows 10 app called Grover Podcast. 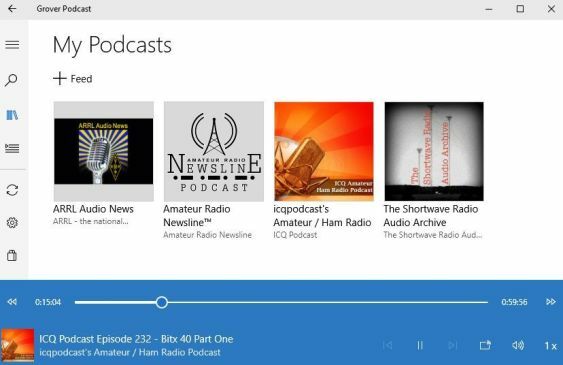 After installing Grover from Windows Store, I went looking for some podcasts related to ham radio and shortwave listening. I found four easily and installed them in Grover. ARRL Audio News is a pretty dry news report from the Amateur Radio Relay League in the U.S. Content is similar to the regular news they distribute in newsletters and e-mails. Amateur Radio Newsline is also a U.S. based show that tries to sound like a real radio broadcast. ICQ Podcast is much more international, basically a one hour chat show featuring some U.K. based hams. They seem to produce two programs a month. The Shortwave Radio Audio Archive. This feed is basically a collection of interesting off-air radio recordings submitted to the archive. There are many, many more. Once you add the feed to Grover (shown above) you can look for new or old episodes and play them on your PC any time. The only challenge to loading podcasts into Grover is figuring out the exact URL of the podcast feed. Generally, I just add the Direct RSS Feed because it is not tied to any particular service or software. Grover will confirm that the feed is working or not. You might need to play around a little bit. If you are a regular Apple iTunes user, setting up podcasts is easy as most source web sites have a “button” to connect automatically. But for me, Grover has gotten me started and it works fine.